Whatever the game, children can always find uses for a playsilk. They’ll twist them into royal crowns or wrap them into pirates’ kerchiefs. They can bundle a doll into a carrier or swing one around a shoulder for a cape. They’re perfect for a skirt or to bandage a pretend wound. Little ones might cover their tea table or curtain a playstand. 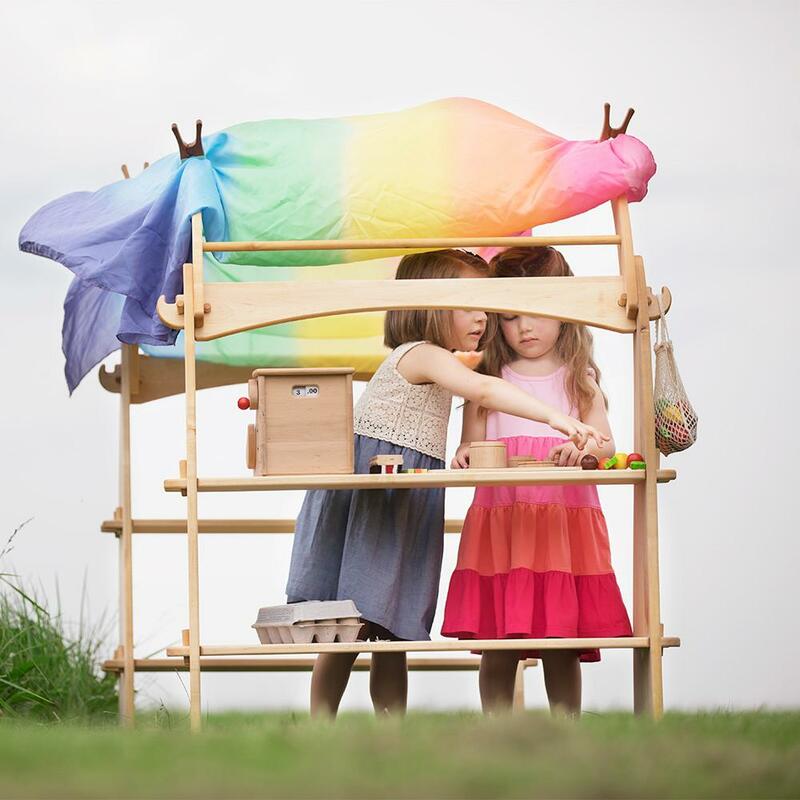 With a basket of playsilks, children are ready for wherever their imaginations take them. The beauty of a playsilk leads to still other uses. You can swirl seasonal colors of silk on your nature table to set a tone— the cool tones of winter, the green of spring or the fiery warmth of summer and fall. 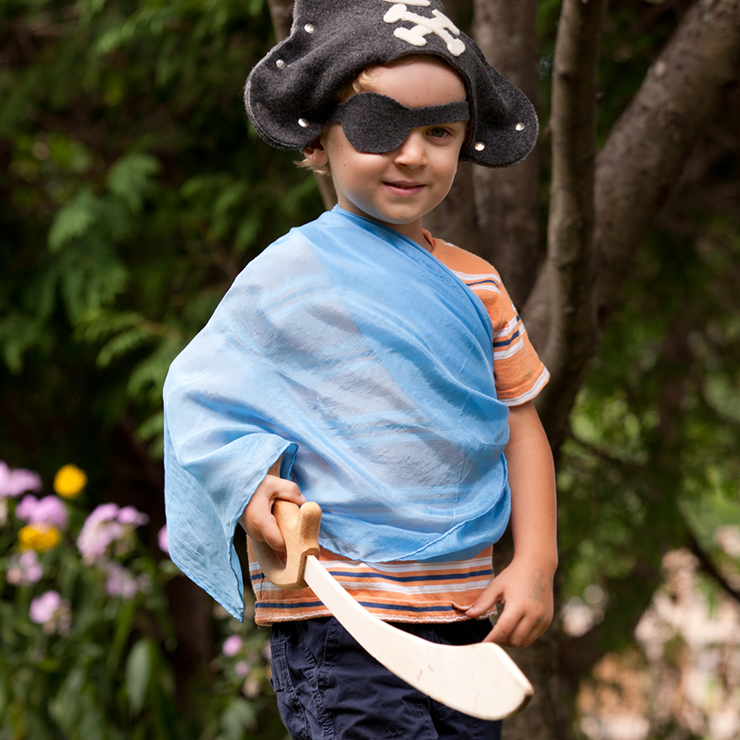 Children will follow your lead and add these colors to their play. Their wooden animals might wade in the edge of a lake where a boat is passing or fire might burst from the dragon’s air or silky green leaves could shade their fairy home. Sometimes, they just need a seed of an idea to figure out new ways to enhance their play. 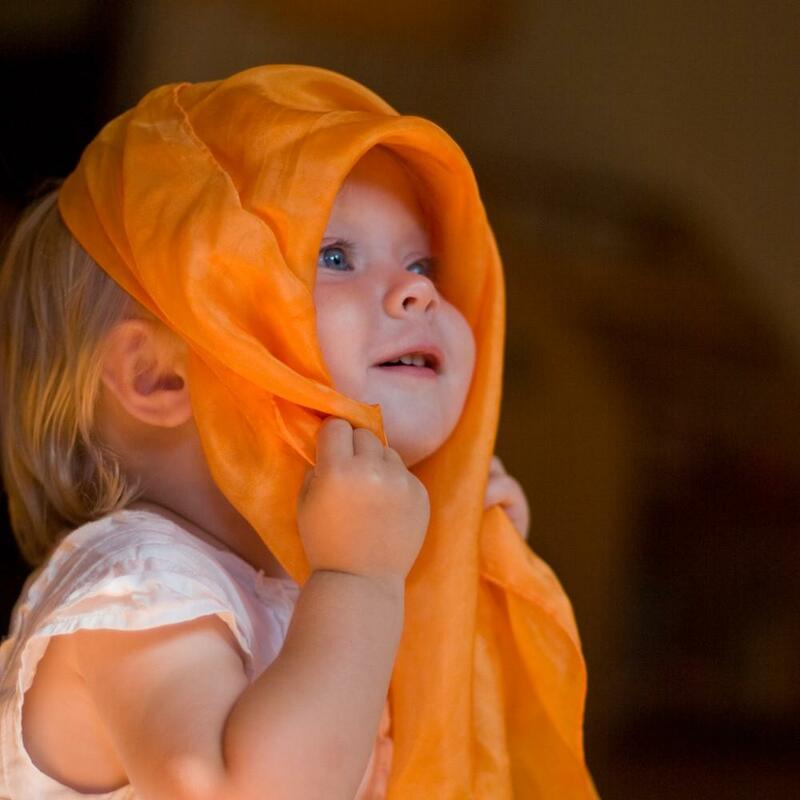 Even very young children and babies love playing with silks. A game of peekaboo is even more fun when the “hiding” baby can still see mom or dad through the translucent silk. Their grasping hands will love the way the texture of silk can vary from slick to rough as they tug it away from their eyes or twist is with their fingers. 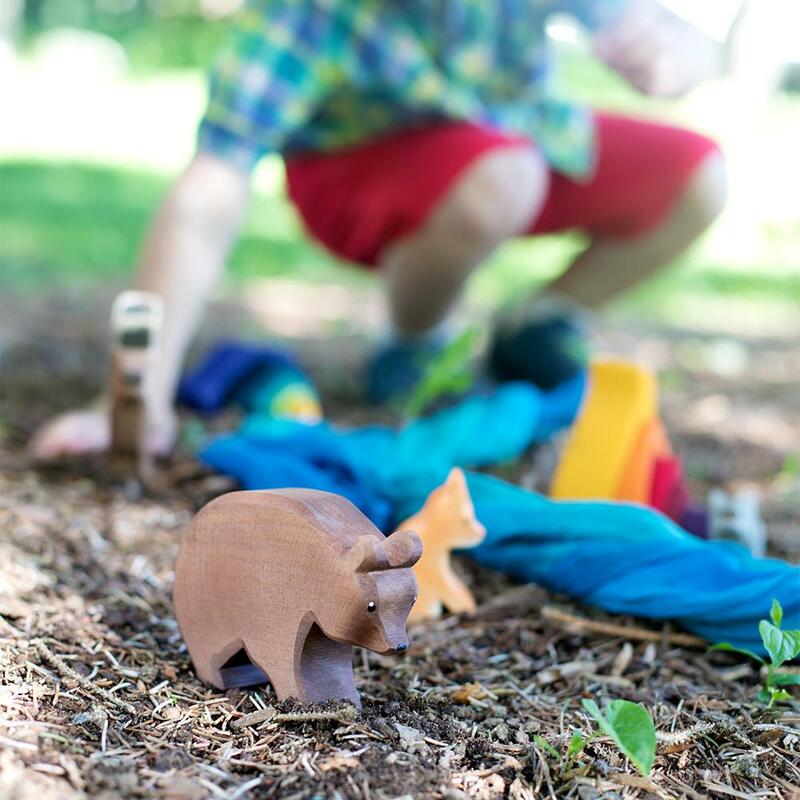 The natural fibers of these simple, versatile toys please the hand and delight the eye. Silk allows light through, each color transforming sunlight, lamplight or candlelight into a mood. 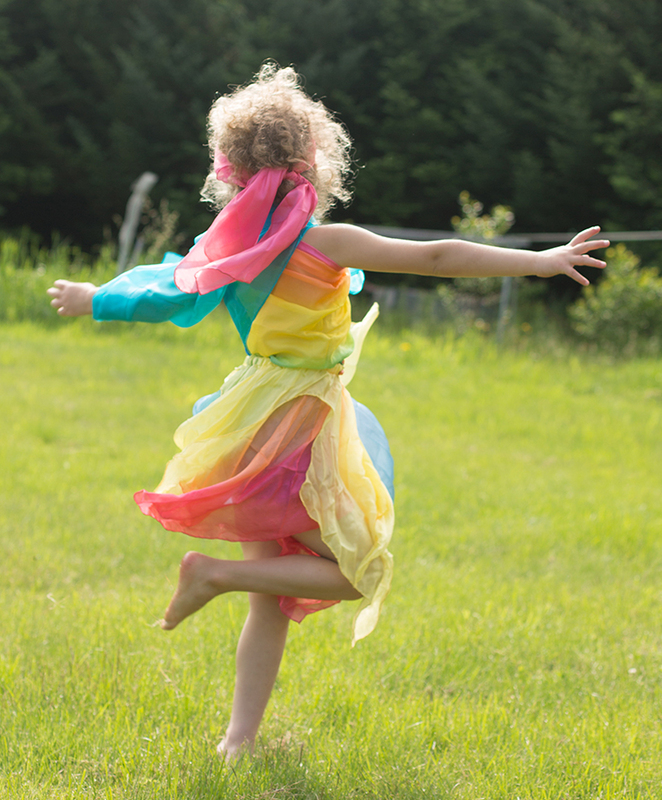 A silken river can shimmer and a leaf canopy made of silk will sway with the breeze of your child’s motion. The surprisingly rough texture of silk makes it grip the surface of wooden blocks or creates a firm knot to keep it in place around a shoulder. Larger silks and canopies make wonderful tents for a child’s imagined adventures. They can play under a rainbow or enjoy the shade of a dark blue starry “sky”, tucked into their own private space within the hubbub of a family room or between the trees in your backyard. When they slip inside such havens, they can also more easily slip into the world of pretend, where they are developing their sense of self or exploring solutions for the troubles in make-believe. These skills then translate into their real world interactions with their family and friends. 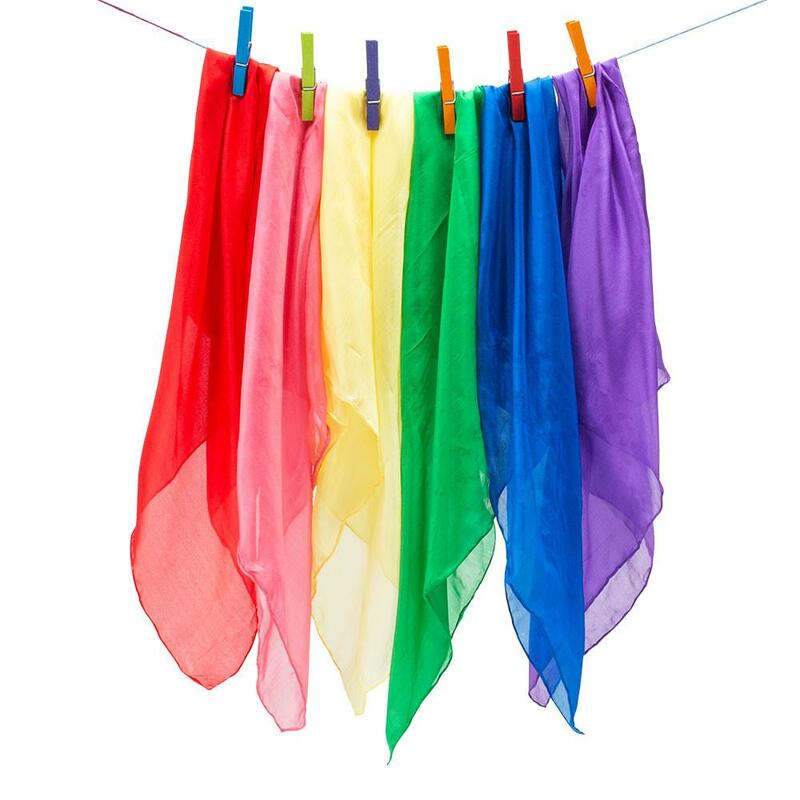 And when playtime is over, silks can be hung for all to see or gathered again in a special case or simple basket. They will sit lovely and inviting until it’s time for a new block world, sea voyage or costume creation.